In the mid-’50s, the day before my first day of school, my mother walked me to elementary school and patiently explained the only intersection I had to cross – at that time still with a policeman in the middle directing traffic with his hand movements. We lived ten minutes away in a terraced house on Rosenhügel in Vienna’s 12th district. My parents were a bit hesitant to bring me to school. I didn’t understand why until many years later. On the first day, after I had been ordered to cross the crosswalk by the waving policeman, I climbed the few steps to the school entrance. The doors were wide open and in the anteroom an elderly woman sat behind a table and asked each child’s name. Her eyes glided up and down a sheet of paper until she found my name and sent me to class 1C, which was on the first floor. I set off but she called me back. “And,” she asked me, “what do you say?” I had no idea what she meant and shrugged. I said, “Thank you Mrs. Director,” and went to the first floor to room 1C. There I stood in the doorway and looked at all the children waiting with their parents in the classroom, until a man standing on a step at the head of the room in front of the dark green panel gestured for me to enter. He also searched for my name on a list, and after he had found all the students of 1C, he sent the parents out. “Nothing at all? What does ‘nothing’ mean?! It does not mean ‘nothing,’ it means ‘without a religious confession! '” He snapped at me and said, while writing in his book: “You sit in the last row during the religious lesson. You must not leave the class and you must not have a say and you do not need to pray.” At home, I told my mother what had happened in class and she reassured me that I did well to simply answer “nothing.” Not everyone should know who we are. The religious teacher came twice a week, and I went back to the last row, sat while the others prayed, but listened attentively because I liked the Bible stories the teacher told. In the third or fourth grade elementary school we got a new religion teacher. When he asked me why I was going to the last row, I said I had “no religious confession,” as I was told. The Judenplatz Holocaust Memorial in Vienna, where Sichrovsky’s parents returned in 1946 after the war. The memorial was built in 2000 for the Austrian victims of the Holocaust. Photo source: Wikipedia. “Come up to the board,” he called to me, drawing a line from top to bottom with the chalk and asking me to write on my side why I had “no religious confession” and brought Norbert, a thin, skinny, nervous boy from the front row to the blackboard and said he should write on the other side why he is Catholic. It was fairly balanced for a while because we both did not know what to write until Norbert, who was desperately trying to grind the chalk between his fingers, just started to cry and the teacher sent us both back to our seats. He shouted at the sobbing Norbert that he was a disgrace to all Catholics if he could not even explain why Jesus had saved us all, and he said to me that he would only be sorry for me because I would be lost anyway. My mother and father came back to Vienna in 1946 from London. They regretted this decision until the end of their lives. Before moving to the terraced house, we lived in Hietzing in a small apartment on the fourth floor, with a door in the nursery that was boarded up with boards because the rest of the house behind it was missing. I had no problems with anti-Semitism, neither in elementary school nor later in high school. The teachers stayed behind, often talking about their experiences during the war, some of them also open about being in the SS, but they left me alone. Life was far more difficult for my parents. They refused to go to speech days and ignored all summons from the teachers and the school administration. Once in the first year of high school, my mother talked to the teachers on one of the language days and said when she got home, she would never go there again. It was not until years later that I realized that she was simply afraid of losing control and saying something that could harm me. She did not want to talk to me about any of the former Wehrmacht officers who were my teachers now. My mother Lotte Kafka with my grandmother, Edith Kafka, and a mountain guide. My mother was able to escape from Prague to England at the age of 16, her mother stayed behind and was murdered in Auschwitz in 1944. I only knew children from families who were friends with my parents. They transmitted the fate of the survivors to their children and also their strangeness in the old homeland. As if forbidding the next generation to feel at home in this land, they isolated us in the circle in which they themselves lived in isolation. The “survivors” were followed by the generation of “children of the survivors,” who, like their parents, felt out of step with events and influences that they had never personally experienced but were constantly present. Who else would understand that? My parents in Vienna clung to friends who had a similar fate and similar experiences. A group of survivors that had returned, who went hiking together on weekends and spent vacations together. In our tiny terraced house, there was a constant coming and going of distraught, often melancholy and torn women and men who denied their mental disorders through war and flight and never accepted any help or therapy. Some felt guilty because they had survived, others were insecure, sensitive and anxious, or went to the opposite extreme and were hard, unfeeling and cold. Those who called themselves “survivors” had survived a concentration camp and spoke almost compassionately, sometimes a little contemptuously, about the “refugees” who had saved themselves abroad, as if there were a hierarchy among the victims. Most, like my parents, hardly talked about their experiences. Relatives, friends and schoolmates no longer lived. Siblings, parents, uncles, aunts, grandparents murdered, disappeared. The survivors replaced the family with us children, the elders played grandparents and we the younger aunts and uncles. At the age of 17, I could not endure the silence of my parents and decided to seek my own experiences. I asked my mother to explain her escape route and wrote to the family in Falmouth, England, which took her in as a 16-year-old in 1938, to see if I could visit them. They responded enthusiastically and invited me. I tried to follow my mother’s path, took the train to London, and on to Falmouth, where the Holdich family – a Quaker family whose name I’ll never forget – embraced me. Some of my mother’s teachers and the director of the school where she had graduated were still alive, and in a few days told me more about my mother than I ever knew about her. On the way back, I stayed in London for a week. It was the time of the Beatles and far away from my parents, I spent every night in a nightclub. My favorites were the German girls. Blond, cheeky, with an openness that I could only dream of as a repressed son of Jewish survivors. Sabine came from Bochum, had long, straight hair and danced so wildly that after a few minutes her beautiful chest under the damp T-shirt moved like a painting by Rubens before me. With a slow tune as she wrapped both arms around my neck, I whispered in her ear that it was great the way we danced here while our dads might have shot each other. She pushed me away and the words just stuttered out of my mouth, that my father was in the British Army and yet it was just a joke, but it was too late; she wanted to know everything. Later she sat in a corner on the floor and cried. I tried to calm her down until I thought, what kind of idiot are you? Not only was the evening messed up, now I also had to comfort the daughter of a German soldier. One year after my trip to Falmouth, I went to Auschwitz. There I found in the archive the death of my grandmother, who was deported from Theresienstadt to Auschwitz in 1944. I could not get any information about my father’s mother and sister. Only recently did I learn that they were murdered in Maly Trostinez. 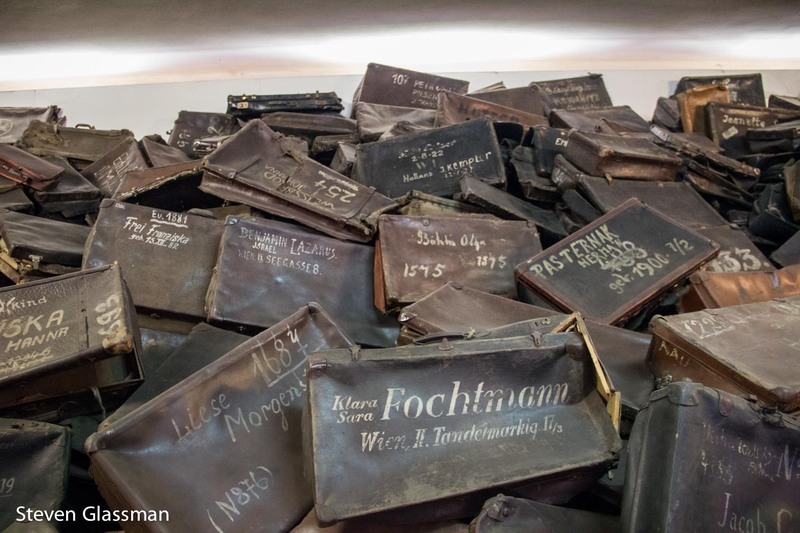 In the Museum of Auschwitz I walked from one room to another, where behind glass lay piles of suitcases, glasses, knives, forks and spoons, hairbrushes and other belongings, looking for clues to my grandmother, reading the labels of the suitcases and the engraved names on the trinkets and hairbrushes. I did not find anything. There was nothing left of her. My parents fled to England as teenagers, and when they came back, others lived in their homes. There were no old children’s photos or wedding pictures, letters or postcards, certificates or exercise books, no childhood toys the parents had picked up, no diaries. Children of the Debris, Jews often grew up without memories that would otherwise be passed down from generation to generation. A story-less generation that has stolen the past or replaced it with horror. The homes where my mother lived with her parents and my father with his parents took in strangers, discarded photos, school books, diaries, and other useless things, using sheets, cutlery, crockery and flower vases and sleeping in my grandparents’ beds. The Jewish Memorial (also known as the Holocaust Memorial) in Berlin honors the Jewish population that perished in the Holocaust. We were passed on the pain our parents suffered, the tears of missing family members appearing on death lists many years after the war, and the insecurity of arriving somewhere or feeling at home – because one day the date will come when it is necessary to go. While rubble women built a future with the bricks of the ruined houses, the consequences of flight and death camps and mourning over lost relatives remained for us. We ourselves are not victims. No one did anything to us. We grew up in a democracy and enjoy all the freedoms our ancestors never had. We are only the children of the victims, and everyone has to deal with them in their own way. Profile photo of Peter Sichrovsky by Keith Claunch. Paperback edition of Verklempt from DoppelHouse Press. Peter Sichrovsky is an Austrian journalist, author, and former politician. In 1989 he co-founded Austria’s liberal newspaper Der Standard, where he served on the editorial board for several years. From 1996–2004, he was a member of the European Parliament. Sichrovsky is the author of eighteen books, including many acclaimed books based on interviews, which include Strangers in Their Own Land: Young Jews in Germany and Austria Today (Basic Books, 1986) about German and Austrian children of Holocaust survivors; Born Guilty: Children of Nazi Families (Basic Books, 1988), based on interviews with children of high-ranking Nazis who themselves suggested the book’s title and which was adapted into over fifteen foreign-language theatrical works; Abraham’s Children: Israel’s Young Generation (Pantheon, 1991); and Incurably German (Swan Books, 2001), interviews with 21st-century German neo-Nazis. Sichrovsky was a foreign correspondent between 1986–1996 for publications including Stern Magazine, the Sueddeutsche Zeitung, and Profil. Currently he writes for the online magazine Schlaglichter, where he is a widely-read columnist.